I'm thrilled to have S. A. Bodeen on the blog today! AND we can't wait for her to come to the 5th Annual Austin Teen Book Festival on 9.28.13! Join us! The Fallout will be released five and a quarter years after The Compound, quite a long gap for a sequel, I know. And the main reason is that there was never going to be a sequel. For one thing, I didn't want to be that person. You know, the one who wrote a crappy sequel. And for another, to me, the story was done. A tad open ended, maybe, but still finished in my mind. And then I started doing a lot of school visits. And Skypes. And at every single one, at least one reader asked, “What happens next?” I quickly assured them, “Nothing. Nothing happens. The story is done.” Funny, but no one ever liked that answer. And after being asked so often “What happens next?” I began to wonder myself. In 2011, a full three years after The Compound came out, I was watching the news, as I usually do, and a science story came on. One of those revealing a remarkable discovery that always gets my mind reeling with possibilities. And I came up with a potential twist for a sequel to The Compound. I couldn't stop thinking about it. A few weeks later, I happened to be on a panel with my editor and had a chance for some one-on-one time. I told her, “You might think I’m crazy.” I told her my idea and she loved it. So in the fall of 2011, nearly six years to the day that I started writing The Compound, I began The Fallout. And now here we are, on the verge of it being released. I realize that those five years were necessary; I wasn't ready to write a sequel before that, and if I had, it most certainly would have been bad. I needed those years to get to know my readers, hear the things they had to say about The Compound, and figure out the best way to continue the story. Not to mention, I've written a couple novels in the meantime and gotten a bit better at the writing thing in general. And hopefully, for the readers, the wait will turn out to be worth it. 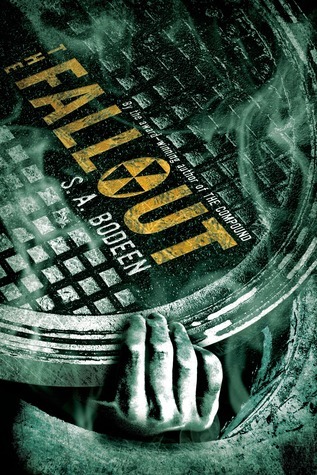 Thanks to Mac Teen Books there is one pbk copy of The Compound and one hardcover of The Fallout up for grabs. Fill out the fancy doo-hickey below to be officially entered. US/CAN only, good luck!